Supporters of Hafiz Saeed, second from left, head of the Pakistani religious party, Jamaat-ud-Dawa, kiss his hands as he arrived at a mosque in Lahore, Pakistan, Nov. 24, 2017. The United States has called on Pakistan to arrest and charge an Islamist cleric accused of masterminding the 2008 attacks on India's financial capital. Pakistani authorities acting on a court order Friday freed Hafiz Saeed from nearly 11 months of house arrest in the eastern city of Lahore. The detention had stemmed from the terrorism allegations against the firebrand cleric. Washington has been offering a $10 million reward since 2012 for information leading to Saeed's arrest and conviction. A judicial panel hearing the cleric's appeal against his "unlawful" detention Wednesday, however, ordered authorities to free him for lack of evidence. In a video message released by his Jamaat-ud-Dawa (JuD) Islamist charity, Saeed told supporters his freedom was vindication of his innocence. 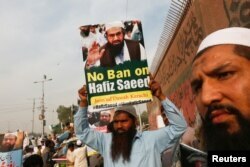 FILE - A supporter of Islamic charity organization Jamaat-ud-Dawa (JuD), carries a sign with others as they listen the speech of leaders (unseen) to condemn the house arrest of Hafiz Muhammad Saeed, chief of (JuD), during a protest demonstration in Karachi, Pakistan, Feb. 3, 2017. "Praise be to God, it is a matter of great happiness for me that nothing has been proven against me which could be detrimental for me or for Pakistan. Thank God, we have been vindicated," the cleric said. U.S. State Department spokesperson Heather Nauert promptly criticized Saeed's release, saying the U.S. was "deeply concerned." In a statement, she went on to say the cleric leads an organization that has been responsible for the death of hundreds of innocent civilians in terrorist attacks, including a number of Americans. "The Pakistani government should make sure that he is arrested and charged for his crimes," the statement read. The U.S. and the United Nations have both declared Saeed's JuD a global terrorist organization, calling it a front for the outlawed Pakistani Lashkar-e-Taiba (LeT) group blamed for carrying out the Mumbai carnage. Saeed has consistently denied any link to the Mumbai violence that left 166 people dead, including U.S. nationals. He has also alleged his detention was the outcome of U.S. and Indian pressure on the Pakistani government. India blames Saeed for masterminding the Mumbai strikes and has linked resumption of normal ties with Pakistan to putting the cleric on trial. New Delhi also alleges supporters of the Pakistani cleric are assisting armed Muslim separatists in the divided Kashmir region. Hafiz Saeed, head of the Pakistani religious party, Jamaat-ud-Dawa, gives Friday sermon at a mosque in Lahore, Pakistan, Nov. 24, 2017. Hours after his release from house arrest, the cleric addressed a massive Friday congregation of supporters at a Lahore mosque, urging that the government not engage in talks with India until the rival country withdraws its troops from Kashmir. Saeed credited Pakistan's independent judiciary for his freedom, saying he was put under house arrest for highlighting the Indian "atrocities" against Kashmiris. "I want Kashmir's freedom from India and this is my crime. I was arrested for it," he told worshippers, who chanted, "God is Great." Saeed's release angered India, where a Foreign Ministry spokesman said that a "self-confessed and U.N.-proscribed terrorist was being allowed to walk free and continue with his evil agenda." A statement quoted Raveesh Kumar as alleging the cleric "was not only the mastermind, he was the prime organizer of the Mumbai terror attacks in which many innocent Indians and many people from other nationalities were killed." The foreign ministry in Islamabad, while responding to the criticism, said the country's courts are determined to uphold rule of law and due process for all citizens of Pakistan. "Legal processes are anchored in rule of law, not dictates of politics and posturing," stated the ministry spokesman. He reiterated that Pakistan condemns all forms of terrorism by any individual or group. The cleric is a major irritant in Pakistan's traditionally uneasy relations with the U.S., and has developed as a main source of historically strained ties with India. New Delhi has linked resumption of peace talks with Islamabad to putting Saeed on trial for planning the Mumbai bloodshed. Islamabad maintains that neither Washington nor New Delhi has offered any evidence substantiating their allegations. Senior Pakistani officials in background interviews maintain that Pakistan has, under its international obligations, imposed travel restrictions on Saeed and frozen his assets and bank accounts. His arrest and successful prosecution in a court of law, however, would require solid evidence linking him to the Mumbai attacks, they maintain. Saeed's organization, meanwhile, continues to collect financial and other donations to support its charity work around Pakistan, causing a major embarrassment for the country, officials acknowledge. They say the cleric's attempts to also associate himself with the Kashmir issue "are also not helping the cause of Kashmiris." The divided Kashmir region has sparked two of the three wars between India and Pakistan, and continues to be the primary source of regional tensions.